World Maker Faire NYC 2014 in pictures. Maker Faire, the greatest show and tell in the world graced New York this past weekend with its biggest display yet. This year's event brought a new slew of start-ups along with the usual lineup of giant 3D printers, massive robots, new development boards and a cast of costumed characters. Whether you're with a start-up looking for a technological solution, a tinkerer in search of new toys or just a kid at heart who wants to learn something new, Maker Faire is a show that has something for everyone. So come with us as we look back at the coolest things from the World Maker Faire NYC show. Intel has long slept in the maker world, letting Arduino and all its variants shape the microcontroller landscape. The PC processor giant recently announced two development boards, called the Galileo and Edison to catch the attention of self-starter developers. Released just last week at IFA 2014, Edison is essentially a mini-computer. It comes equipped with a 500MHz dual-core Atom processor that can run x86 applications and most Linux distributions. If the specs weren't impressive enough, we got our first in-person look at Edison and it's no bigger than an SD flash card. Onboard this tiny computer there's also a low-power 100MHz Intel Quark processor designed for wearables. Edison is a fully packed, standalone system complete with 1GB of RAM, 4GB of eMMC storage and built-in Wi-Fi as well as low-energy Bluetooth 4.0. Intel demoed Edison at Maker Faire booth by building it into a hard hat-mounted emergency alert system made for construction workers. The Intel researchers demonstrated how the system worked by swinging a baseball bat onto the hardhat. The impact then triggered motion sensors to activate a GPS signal, which would in turn help rescuers on the location of the construction worker in peril. Since hitting the maker block in 2005, Arduino has spawned thousands of microcontrollers. 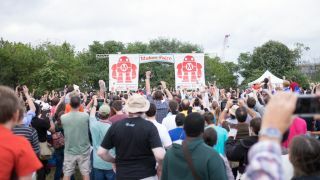 Now nine years later at a Maker Faire NYC talk Arduino Project co-founder Massimo Banzi said the platform is maturing into a more user-friendly platform. Banzi shared Arduino Tre is almost ready for its big release as the "most powerful Arduino to date." The Tre will be Arduino's first microcontroller powered by ARM Cortex-A8 processor made in partnership with Texas Instruments. On top of the more powerful hardware, Tre is also slated to be the first Arduino capable of running a full version of Linux. Meanwhile, Banzai said the Arduino team has been hard at work developing a stack of software, which will make it easier for everyone to use especially if they aren't Linux geeks. Banzai also touched on the Arduino Connected Apartment - an internet-connected home experiment the microcontroller team is running in collaboration with futurist Bruce Sterling. The apartment is actually a mock living space located in Arduino's Turin, Italy headquarters. Along with Sterling's lavishly designed Italian furniture, the apartment is furnished with the latest technology made for the maker community including many Atmel based devices. "All of the houses of the future are fake, but you'll be able to rent ours on Airbnb," Banzi said at his Maker Faire presentation. Speaking of computers on a stick, Raspberry Pi's Director of Hardware Engineering James Adams was at Maker Faire to present the future of the credit card sized PC. Moving beyond the classroom and educational uses the Raspberry Pi foundation introduced a B+ model. The main highlight of this new computer board is it has more connectors including a 40-pin GPIO header and four USB 2.0 ports. Along side the model B+, the foundation also launched its Compute Module Development Kit in April. With these new additions Raspberry Pi has become a platform for developers to create new inventions such as the Slice media player and the recently announced ProtoCam. Despite moving into a new market of makers and device creators, Adams clearly stated the Raspberry Pi is still a charity and will put education first. "We [the Raspberry Pi Foundation] are and will continue to spend all of our money on creating educational resources," Adams said. The new Kinect for Windows might not be here yet, but when it's finally released users will be able to scan their face and have a plastic copy sent to their house. On September 16 Microsoft announced a new R5 version of its 3D Builder, which gave households without a 3D printer a new option to buy a print and have it sent home. At Maker Faire the Redmond company had a custom PC connected to a Kinect for people to scan themselves into a 3D model. The process was so simple anyone could do it. All it required were a few clicks and then panning the Kinect horizontally across the subject. At another table, Microsoft also set up a Kinect that would scan booth visitors transforming them into Xbox One avatars. I witnessed the Kinect create a virtual selfie of a child in just a few seconds using three simple scans. A company spokesperson explained that the imaging sensor first creates a wardrobe for the user's virtual self by detecting what color their clothes are. The depth-sensing camera then photo copies a user's face, noting facial structure - from the shape of their nose to the distance between their eyes - all while recording their skin color. The Microsoft spokesperson also said the team had been working on the technology for some time, but could not share whether the feature would come to Xbox One. The spokesperson declined to comment on an exact release date for the new Kinect for Windows. Next Page World Maker Faire NYC 2014 in pictures.